Namya or fish curry is eaten with thin rice noodles and assorted vegetables. Traditionally, there is no namya curry paste. Namya curry paste and curry is all made at the same time. With the new modern life style and more Thais living aboard, namya paste was born. To make it like in the old days, all the ingredients are boiled first, fished out of the pot then pounded into a paste. 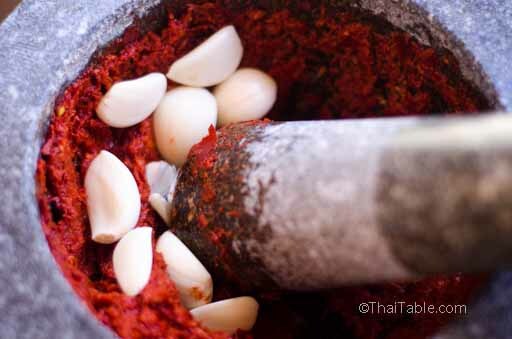 Now, Namya curry paste is made similar to all the other Thai curry pastes by pounding all the ingredients in a mortar before adding to the coconut milk. Like all other recipes, Namya recipe is passed down from generation to generation. My recipe came from a family cook that could claim that her Namya made it all the way to the Thai parliament. During one of the many military coups in Thailand in the 70's, her namya made it to the table of the coup leader. However, saying that the namya curry made it to the Thai parliament was a stretch because the general was the only military coup leader who refused the prime minister position after the successful coup. 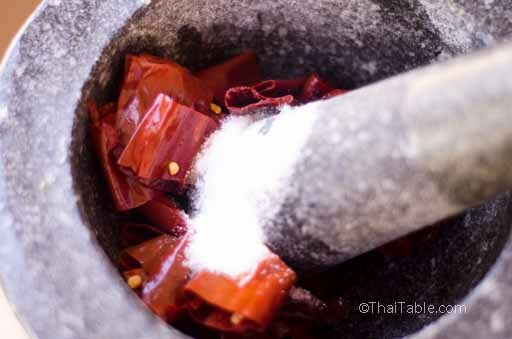 For a hot curry paste, use smaller dried peppers. For a mild curry paste, use large dried peppers like Anaheim peppers (aka California peppers). Chinese keys give namya its distinct flavor and aroma. Adding a lot of garlic is another secret of this recipe. Notice that there is no kaffir lime zest in Namya. In a pinch, I often cheat using dried ground Korean pepper (for kimchi making) in place of dried peppers. 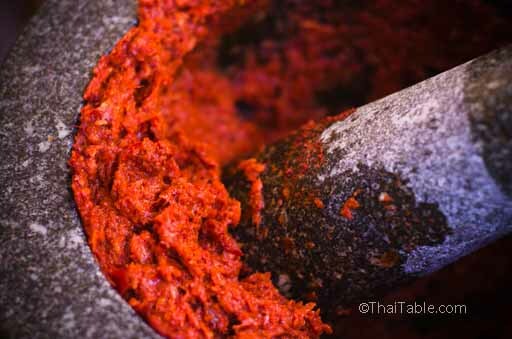 The key in making any curry paste is adding chili peppers first, then follow by hardest ingredient with the least water content. Namya curry paste has either salted fish or pickled fish in place of shrimp paste. 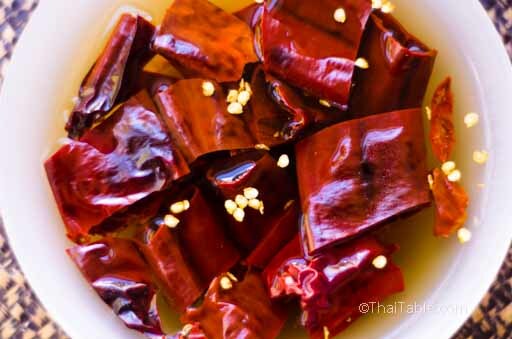 Cut the dried whole chili peppers into big pieces, 1 inch, discard the stem and soak them in warm water. Slice galangal, shallots, lemongrass and Chinese keys into small pieces so that they are easy to pound in the mortar. Drain and squeeze chili peppers dry. You may want to use a glove if you have sensitive skin. Your hand may feel the tingle and burn afterward. Place the damped peppers and salt into the mortar. Pound until the peppers turns into pulps. Add sliced lemongrass and pound. Follow by galangal, garlic, shallots and Chinese keys. Pound as each ingredient is added. Add the pickled fish or salted fish the last. Mix or pound the paste again. 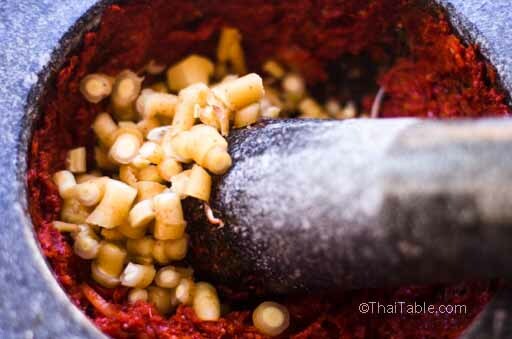 The curry paste should be smooth, no recognizable ingredients. The bright orange color comes from the chili peppers. 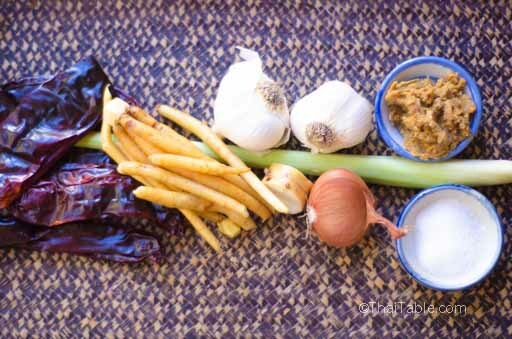 The namya curry paste can be stored for at least a year in a freezer. This recipe should make enough namya curry for 8 servings. I usually use half of the paste for 4-5 people and freeze the other half.